Now I think, when there are many opportunities in front of you, you should pick the easiest and the best. Which we call cherry picking. 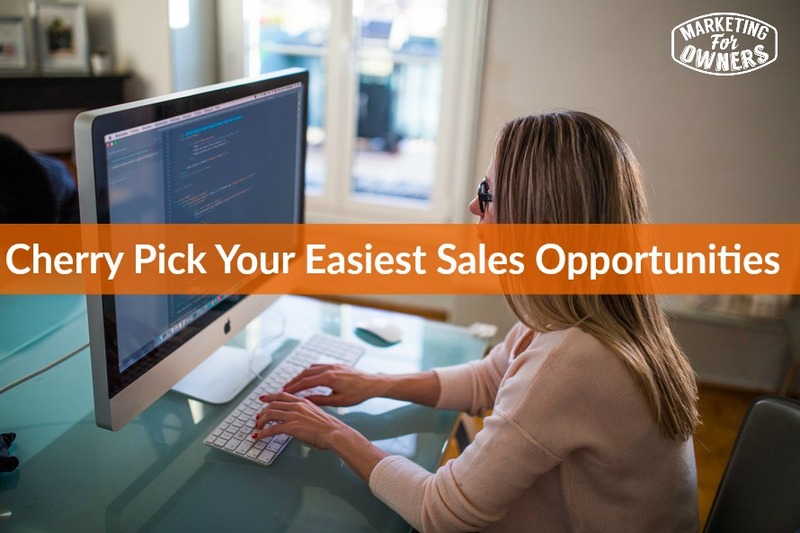 So in sales, for example, you have different types of potential customers. You have cold customer, people that have never heard of you. Don’t know who you are. You have warm, leads. Call these leads. People who’ve possibly heard of you, but have never bought from you. And you have people who are currently buying from you and you have people who have bought from you in the past and no longer buy from you. Now, of all of those who do you think would be the easiest to sell to? Well you can say that people who are currently buying from you, are currently buying from you. So, of course, keep in touch with them. Continue to nurture them as they, build that trust, as they put trust in you, continue to build on that. So don’t, don’t forget them. Convert them from buyers into repeat buyers and then into regular buyers. So after that, the second easiest. You’ve probably heard it before. That it costs a fraction of the cost, to sell to any, someone who has previously bought from you or to an existing customer. Then it does to go find a new one. So in the list of things, why not try and restart people who’ve bought from you in the past. Now there’s a lot of you who have been in business for 5 years, 8 years, 10 years, 15 years. I can guarantee that in your list of clients, there are people that have bought from you who were extremely happy with what you did. And they may have just finished with all, used the service or product that you had at the time. But you are bound to have developed new services, new products since that time. They’ve perhaps moved on to another business. But would still be interested. They perhaps had tough times, couldn’t afford it at that time. But they can afford it now. So I would recommend that before you put a lot of frustrating effort into getting new customers, go and attack people who have, well not attack, wrong word probably. Go and aim for people who have bought from you in the past, but are not currently customers. So there is a huge world out there of them. Now that means they will have the same effect as a brand new customer, because they have been forgotten about, they’ve forgotten about you. And there are many ways you can go and speak to them. Now this is another thing, you have options then, so once you drill down to picking out the type of customer, or type of potential customer, then you have ways of contacting them. You can contact them by phone, means you don’t have to go anywhere. When was the last time you picked up a phone and spoke to customer, or a potential customer. And tried to get a sale. Then you have the possibility of writing to them, let’s call that direct mail. You can just simply write to them and say, ‘Hey, remember us…’ and take it from there. And by the way, when you do phone them, of course you are not going to phone them up and just ask them for an order. You are going to find an excuse in how to speak to them. There are many methods on this site, I am pretty sure I’ve covered this in previous podcast episodes. But do not dive in, just because they bought from you before. You’ve got to reestablish that connection that is a very very very warm lead. You have to reestablish, rebuild that trust. So the best way to do that is to talk to them, and to ask them how have their circumstances changed, when they used to buy. Just do tell them, you are doing some surveys and as they were a previous great customer, just want to know from their opinion. Why did they stop buying and what do they do now? For that solution, who do they buy from now, do they still use it, how have things changed, how has their job changed, etc. Get talking to them and just have a conversation. You will be amazed, what you’ll learn that will help you with your marketing and help you build that relationship. And don’t forget they are helping you and they are talking to you. So thank them. And the other one is reps, sales reps. Have you got sales reps on the road? Do you yourself go out visiting potential customers? When you are in the area, why not have a list of previous customers, and when you are in the area, just poke your head in, and just say, ‘Hey, hi, just popping in. don’t know if you remember me, but from a couple of years ago, you used to buy so and so and so.’ And they go, yeah, yeah. Sure. Well just poke your head in and just see how things have changed. We just wondered out of interest, why you didn’t continue, why etc., etc. And say, one thing you probably don’t know is that we have this new, and this has been the most popular, etc. etc. you get the gist, don’t you. So before diving in, remember cold calling, cold sales. People who have never heard of you, is the absolute hardest, so why start there? Start with the easiest, and then work to the second easiest, then to the third easiest, before you get to those. And even better, do a bit of pre stuff, warm them up before. So if you advertise in places, those people may have heard of you. If you send out a letter in advance to a bunch of people in your niche, in your target area, why not call them up after that, so it’s not completely cold. Remember make everything easier for yourself. It does work. Okay. That’s Monday. It’s time for book for the week. On this show we have recommended Gary Vaynerchuk many times. I would imagine, I’ve recommended all 3 of his previous books. Such as Crush it and Thank you Economy. They are good books. Not only is he an excellent marketer, he’s very transparent and very much a doer. But his stuff is actually good. And it works. He’s built a massive massive business off it. So he also has a podcast, called Ask Gary Vee. Now his book that I’m going to recommend is his latest, his fourth book. It’s called #AskGaryVee. And that is, if you look, searching for it, it’s all as one word. Because it is a hashtag. Yes you get it. This is excerpts from his show. If you try to go back and listen to every show. You’ll just never get around, so he has taken all of the best information because most of it is evergreen. It relates to social media, it relates to running the business, to entrepreneurship, to work life balance — everything, it’s an excellent book and really enjoyable. You can read it in small chunks, which is what I like. So #AskGaryVee. Our book for the week. Go read. I will be back with you tomorrow, with another tip.